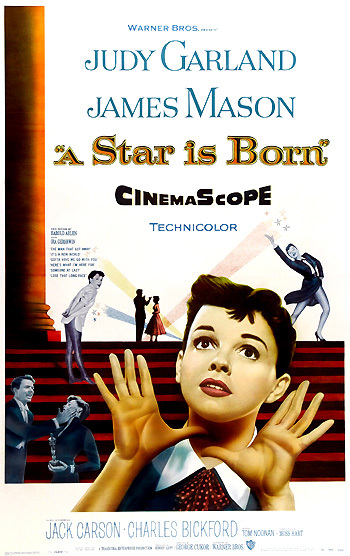 A Star is Born is the superb 1954 musical, acclaimed by many as the greatest Hollywood musical ever made. Judy Garland's intense performance as the main character, probably the finest of her entire career, illuminates the film based upon Moss Hart's screenplay. It is a remake of William Wellman's original 1937 film by the same name that starred Janet Gaynor. The third version was a poorly made A Star is Born (1976) with Barbra Streisand as a pop singer named Esther Hoffman and Kris Kristofferson as John Norman Howard - a rock star. The emotionally-intense film also hinted at the real-life troubles and problems (five marriages) in the career of its female star - a victim of the Hollywood studio system - during the film's making. Garland's realistic performance reflected the upheavals in her own personal life that led to her death from a drug overdose - and ironically, this film's co-star James Mason delivered her funeral's eulogy in New York in 1969. Predicted to win the Best Actress Oscar, Garland was devastated by the loss to Grace Kelly in an lesser role in The Country Girl. The film was both a disappointment at the box-office and at awards time. There were many unrewarded Academy Awards nominations - no Oscars for six nominations including: Best Actor (James Mason), Best Actress (Judy Garland), Best Color Art Direction/Set Decoration, Best Song ("The Man That Got Away", music by Harold Arlen, lyrics by Ira Gershwin), Best Scoring of a Musical Picture (Ray Heindorf), and Best Color Costume Design. And both director Cukor and screenplay author Moss Hart were neglected in the nominations. The film, considered overlong at three hours, was drastically cut by Warners' film studio after its initial release. Painstaking restoration in the early 80s resulted in a revised, 170-minute version. Mister Maine is feeling no pain. I don't need any more pictures, I don't need any more interviews, because the public loves me. When Esther is performing in a song and dance act during a performance by the Glenn Williams Orchestra, Norman lurches onstage, making a drunken spectacle of himself in front of the audience. Still dancing and singing, cleverly incorporating him into her routine, she saves him from major embarrassment and leads him off the stage as the audience applauds. You must have been born with that name. You couldn't have made it up. I know myself extremely well. I'm just near the fighting stage at the moment, and if I don't get my way, I begin to break up people and things. You know, drunk or not, he's nice. A sullen Libby takes Norman safely home to sleep off his drunkenness. In the middle of the night, haunted by the memory of Esther, he awakens and determines to track her down. He first goes to the Cocoanut Grove, thinking she might be there. A well-known, frequent womanizer, Norman discusses and rates potential pickups and conquests with the maitre-d: "Too young. I had a very young week last week. It's not worth it." It is suggested that he might locate Esther at an empty, after-hours Sunset Strip musicians' hangout. When he enters the club, he is transfixed as he watches her sing the torch song blues/ballad classic, "The Man That Got Away," a memorable performance to a room filled with stacked chairs. There are certain pleasures you get, little - little jabs of pleasure when, when a swordfish takes the hook or - or - or when you watch a great fighter getting ready for the kill, see? You've got that little something extra that Ellen Terry talked about. Ellen Terry, a great actress long before you were born. She said that that was what star quality was - that little something extra. Well, you've got it. Esther: Do you know the only thing I can think of right now? The only thought that comes into my mind is the way I wash my hair. You see, when anything happens to me good or bad, I make straight for the shampoo bottle. Why would I have to think of that now? Norman: I understand that perfectly. With me, it's golf balls. If I'm happy or if I'm miserable, I - I putt golf balls around the living room. It makes perfect sense. I can remember my first job singing with the band. And then one night stands clear across country by bus. Putting on nail polish in the ladies rooms of gas stations, waiting on tables. Wow! That was a low point. I'll never forget it. And I'll never never do that again, no matter what. But I had to sing. I somehow feel most alive when I'm singing. Have you had enough, as the Republicans used to say?...You know about as much about me now as I do about myself. Listen to me, Esther, a career is a curious thing. Talent isn't always enough. You need a sense of timing - an eye for seeing the turning point or recognizing the big chance when it comes along and grabbing it. A career can rest on a trifle. Like - like us sitting here tonight. Or it can turn on somebody saying to you, 'You're better than that. You're better than you know.' Don't settle for the little dream. Go on to the big one...Scared? Scared to take the plunge? He gives her some final words of encouragement before he leaves: "Don't ever forget how good you are. And hang on to that. Because I'm right." And then, he delivers his trademark farewell words to her, repeated later in the film: "I just want to take another look at you." He gave me a look at myself I've never had before. He saw something in me nobody else ever did. He made me see it too. He made me believe it. She is determined "for a chance at being something, something bigger than I ever dreamed of. And I'm not going to turn back now, ever." Danny thinks she is a fool. The next day, Norman leaves town for six weeks, shooting a new film in a distant locale. He can't recall her address. Meanwhile, Vicki has left her band and become unemployed. In the meantime, she has provided the singing voice for television commercials and worked as a carhop in a hamburger drive-in. Hearing her voice singing a commercial on TV, he finally locates her. He sponsors her entry into show business, recommending her for a screen test. She passes the test and is hired as a contract bit player at the Oliver Niles Movie Studio (Norman's studio), although she is treated as another one of Maine's conquests. She is shuttled through the studio, passed from one person to another, greeted cordially but impersonally: "Glad to have you with us." In Vicki's first minor acting role, she is yelled at by the director for not following his directions in a farewell scene: "I don't want to see your face, see." By the end of the week, she is renamed Vicki Lester. Then, Maine is able to cajole the reluctant studio head Oliver Niles (Charles Bickford) to listen to Vicki sing and she gets her big break. She is put in the lead singing role of a musical comedy when another singer cancels out of her contract. In this lead film role, seen in the film's preview screening (a 'movie within a movie'), at a special showing in which Norman's new film is also being previewed, she performs the classic, 18-minute sequence, opening and closing it with "Born in a Trunk." It is one of the finest and most distinctive musical film sequences ever made. It is presented as a career success story, a vaudeville performer's rise to stardom, and an exquisitely-staged musical "biography" of Vicki Lester's character. (It is also a near-autobiographical account of actress Judy Garland's own show business career). In between the opening and closing song, she comments on being a "ten-year-overnight sensation," singing such classics as "I'll Get By," "You Took Advantage of Me," "My Melancholy Baby," and "Swanee" (in a minstrel-like performance, wearing a man's hat and suit). It's all yours, Esther. And I don't mean just the Cadillacs and the swimming pools. It's all yours, in more ways than one...You're going to be a great star, Esther. Don't let that change you too much. Don't let it take over your life. You're very dear. Vicki: Norman, don't you know how I feel about you? Norman: Yes, yes I do. Vicki: Well, then dear, don't you know that nothing about you could make any difference? Norman (despairing and warning her): It's too late. Norman: It is, I tell you...Now listen to me. I destroy everything I touch. I always have. Forget me. I'm a bad loss. Vicki: I don't believe that. Norman: You've come too late. Esther wants him to believe that it is not too late and that they should give themselves a try.